Life in the Schmidt House: GFF! 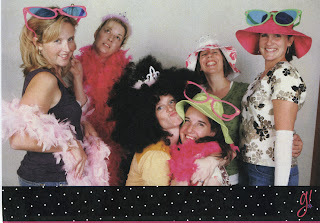 So me and my gal pals (hee hee) got together tonight for a super-fun party that Group (john's company) was putting on to launch their new Girlfriends Unlimited line. It was a blast! We got facials, hand massages, played DDR (dance dance revolution) got our pics taken, played games, danced and everything (all without kids on our hips). Way fun! I also got my hair done...I think an afro looks great on me! (From L-R: Shelley "Shell Toast", Steph, Beyonce, Nicole "Cole", Gretchen "Crackers", and Melissa) Good Times. Looks like SO much fun! Wish I could've been there to dance with you, but I'm loving the picture for sure!